Australia has endorsed Abe’s proposed defense reforms, but hopes to avoid upsetting China. Australia’s new foreign minister referred to Japan as Canberra’s “best friend” in Asia and announced Australia’s support for Japan’s military modernization during her first trip to Tokyo in her current position. Later during the visit, Bishop announced that Australia supports Shinzo Abe’s effort to adopt a normal defense posture. She continued on this theme in a speech at the Japan National Press Club. “We look forward to Japan making a greater contribution to security in our region and beyond – including through our alliances with the United States," Bishop said The Australian reported. 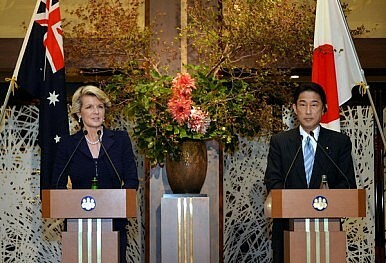 In an interview with The Australian following the speech, Bishop brought up the example of Afghanistan to justify her government’s policy on Japan’s military. The move is almost certain to win the ire of China, which resolutely opposes Prime Minister Abe’s effort to enable Japan’s Self-Defense Forces to operate under a doctrine of “collective self-defense,” which would allow Tokyo to respond to attacks against allies or close partners. Among the potential cases where Japan could intervene under the banner of collective self-defense is if the U.S. and China went to war over Taiwan. In her interview with The Australian, Bishop similarly took issue with the argument made by Huge White, a leading Australian strategic analyst, that China might withdraw from free trade agreement talks with Australia if Canberra lent its support to Abe’s desire to change Japan’s defense posture. The past few weeks has thus highlighted the delicate balancing act the Australian government under new Prime Minister Tony Abbott will have to walk in its regional diplomacy. Last week, at the Asia-Pacific Economic Cooperation (APEC) summit, Abbott and Chinese President Xi Jinping sought to reinvigorate bilateral free trade agreement talks by announcing a one-year deadline on their competition. Abbott’s government, however, has pledged to conclude FTA agreements with Japan and South Korea during a 12-month timetable as well (Australia is also a party to the Trans-Pacific Partnership). Putting aside the various economic issues involved, with Tokyo at odds with both of its neighbors these goals are ambitious to say the least. Besides dealing with the three Northeast Asian powers directly involved, Australia also has to factor in the position of the U.S. on all these issues. That said, Australia can take comfort in knowing that it is not alone in trying to grapple with such delicate issues. This is the reality all parties face in an increasingly polarized region. Both countries are trying to centralize security decision-making. Could this help avoid a clash? The Art of the Balance: Japan, China and the United StatesSouth Korea’s Real Fight Is With China, Not JapanJapan, China Agree to Implement East China Sea Crisis Management HotlineJapanese Vs. Chinese ExceptionalismWill an Abe-Xi Meeting Happen on the Sidelines of the 2016 G20 Summit?